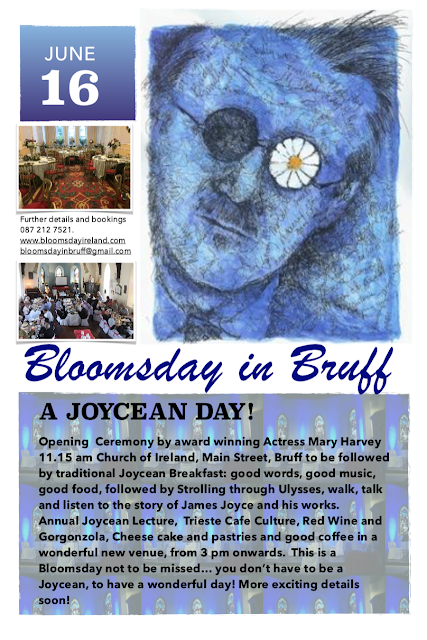 With best wishes received from fellow Joycean’s in Rome, Trieste, New York (Alphie McCourt), Dublin, (The James Joyce Centre) and from Pula in Croatia, (where Joyce spent some time before settling in Trieste), Bloomsday in Bruff began on the steps of the historic Church of Ireland, the oldest building in Bruff. 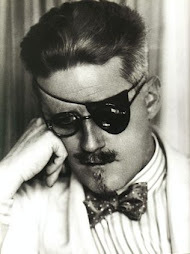 Bloomsday, the 16th June, commemorates the day James Joyce met his wife in 1904. 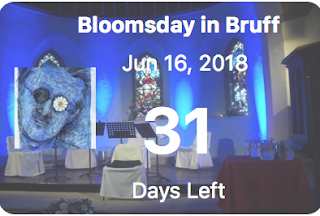 This is the ninth year of celebration in Bruff. Donal Thurlow, Director of the Festival, welcomed everyone, and commented on how magnificent everyone looked, dressed in their 1904 style finery, with many ladies wearing wonderful hats that out-shined anything at Leopardstown or Ascot. The school choir from Scoil Dean Cussen were first to entertain. They sang several songs accompanied by their musicians, including their alternative National Anthem, which they had sung as finalists in the National Concert Hall, and were appreciated with great applause. 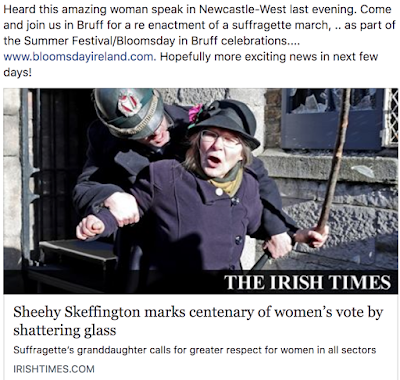 As usual, Bruff’s own Mary Harvey, stage and screen actor, declared the festival open with some aplomb, which she did this year, by arriving in a vintage, miniature, fire engine. Cllr. Bill O’Donnell, Cathaoirleach of the Municipal District of Cappamore-Kilmallock and Gerald Mitchell, Deputy Mayor of the City and County of Limerick were both present. Cllr. O’Donnell, a supporter of the festival since its inception, also welcomed everybody. 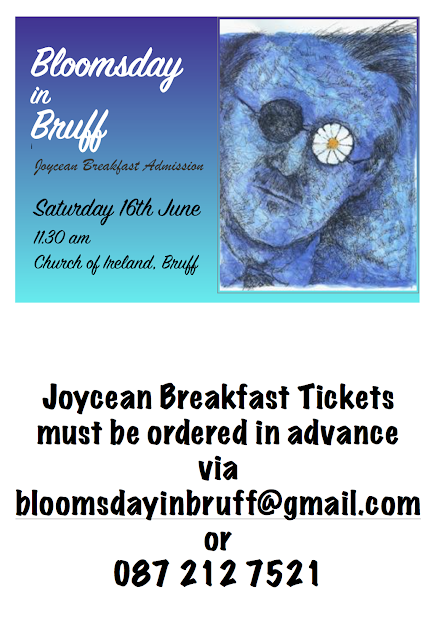 Those who had been lucky enough to purchase tickets in advance, went into the church for the sold out ‘Joycean Breakfast’, liver and kidneys included! Whilst breakfast was served Jade and Noreen of ‘Dolce’ entertained with songs from Joyce. 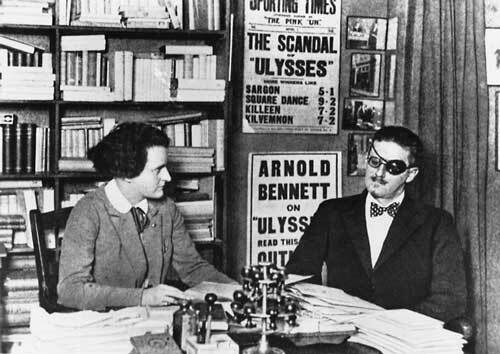 In the hall there was an exhibition of books by and about James Joyce, including rare and valuable first editions. In introducing items, the fact that this was the 100th anniversary of “Portrait of an Artist as a Young Man” was noted as were the many connections and mentions relating to Limerick in the works of Joyce. The friendship between George Clancy, Mayor of Limerick (on which the character of Davin in ‘Portrait’ is based, was noted. 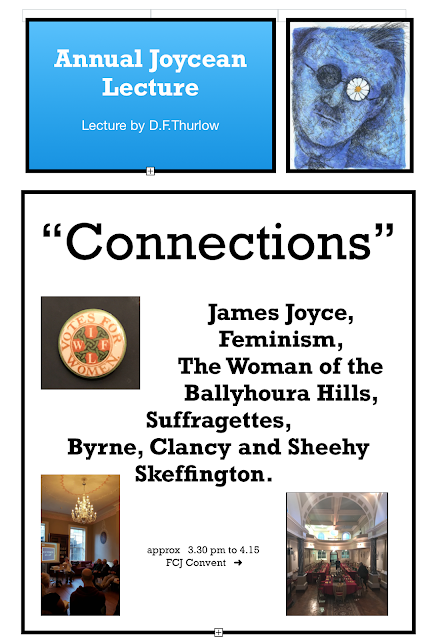 Limerick Lace, the lady of Ballyhoura, Garryowen are amongst many other references to Limerick in the works of Joyce. The winner of the Gold Cup in Ascot in 1904, was a horse called Throwaway, and Joyce used this fact as an important part of the plot in Ulysses. As this years Gold Cup Race was taking place on Bloomsday this year, the assembled crowd squeezed into Paddy McAuliffe’s Bookmakers, on the Main Street, to hear a short talk about the event and the relevant excerpt read by Mick Lacy. Proceedings then moved on to Clancy’s Pub, for readings, music, and film excerpts, accompanied as is traditional with gorgonzola and red wine. Readers, included Mick Lacey, Mairtin O’Briain and Nenagh Writers Group, (who performed a play written by Austin Kenny). You require some stamina to complete a full Bloomsday, and just as the crowd began to thin out, the excellent Brass Quintet, “No Strings Attached” set up to perform. Their programme included a special version of ‘Mise Eire’ by Sean O’Riada, who gave his first public performance as a musician, in the hall in Bruff. 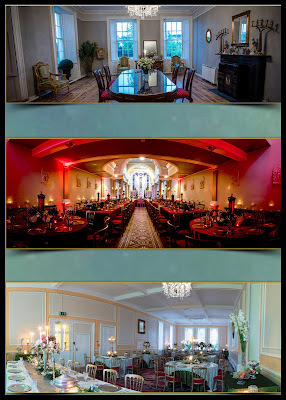 (the family lived in Bruff where his Garda father was stationed).
. 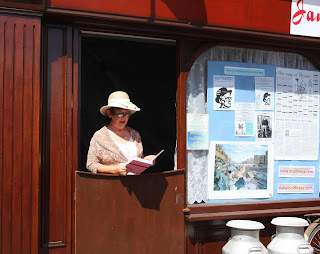 But we need not have worried about an audience, as the doors burst open and a coach load of wandering Joycean’s, arrived from their Bloomsday meanderings, to add their singing and enthusiasm. Celebrations continued in various hostelries and venues until the wee small hours…. casual visitors did not express much surprise upon walking in to a pub in Bruff, and finding well dressed people (in the styles of 1904) deep in discussion about the works of James Joyce… its what you expect in Bruff every 16th of June! Note: ‘The two murdered mayors’, is still a familiar Limerick expression, particularly among older citizens. 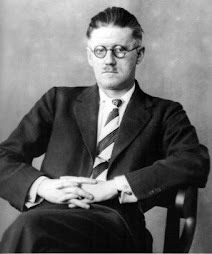 George Clancy was elected as Mayor of Limerick in January 1921 and Michael O’Callaghan had served in that office in the previous year. Both men were killed by British military forces in the small hours of Monday 7 March 1921.